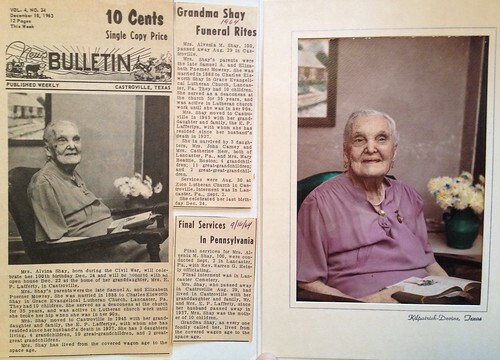 This is Alvina Shay, my Mother’s Grandmother. I don’t know too much about Mom’s side of the family…I vaguely remember going to visit relatives in Lancaster, PA as a child of 7 or so. I remember Mom talking about Aunt Katie (Catherine Shay Herr, who passed in 1980) and her daughter, Charlotte Lafferty (Charlotte married Ellis Lafferty…they lived in Castroville, TX). The obituary says Alvina had 4 grandchildren…out of 10 kids, 4 seems like a small number (after doing some searching, I found a picture of Alvina’s and Charles’ gravestone and sadly discovered that many of their children passed away quite young). My mother had two brothers, add Charlotte, and that would be the four grandkids. My mother had two children and one stillborn, one of her brothers had two (one step), so Charlotte must’ve had 7. And I don’t know a one of them! Not even my uncle’s kids, although I remember playing with my cousin, Brian, when I was very young (I think he’s in the Seattle, WA area). So, I’m just putting this out there, because you never know! Anyone know any of the Lafferty’s of Castroville, TX? Charlotte passed in 1987 and her husband in 1977, but it’s possible their children, my age-ish, would still be in the area. Asking about Herr families in Lancaster would be like asking about Smiths elsewhere, so I’m pretty sure that would be a dead end. Or Brian Beattie, in Washington state? Thanks to Jenn, who came up with Time Warp Tuesday! Hmmm… maybe put this out on facebook? My mom has gotten heavily into researching our fmaily tree and all it’s diverse branches. It is amazing to find things out and they have met many distant relatives during the hunt! Well, you still have and always will have your sill cousin, MB! I cannot remember a day or year without you in it. We’re so blessed our parents raised us together. Wouldn’t it be WONDERFUL if you found some relatives!!! Oh I dearly hope you do! Only having 40% of your children survive is a heartbreaking statistic. I cannot even fathom losing 6 children. I love the idea of looking up long-lost relatives… I hope you find a few. I just sent you an email with a link to a Brian Beattie possibility?? ?